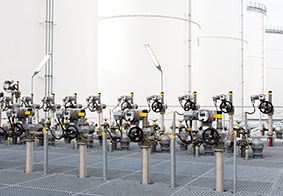 Around 500 AUMA electric valve actuators have improved the speed, flexibility and safety of flammable liquids transfer at the Koole Tankstorage Minerals terminal in the Port of Rotterdam, the Netherlands. AUMA’s scope of delivery includes the company’s proven SAEx explosion-proof multi-turn actuators equipped with intelligent ACExC actuator controls. Most of the actuators are fitted with AUMA gearboxes. AUMA has also supplied actuators with custom conversion kits for valves that were previously operated manually. All the actuators have been successfully integrated into a Profibus control network. To enhance safety at the terminal, the actuators are equipped with hard-wired additional ESD inputs for emergency shutdown. The Koole Tankstorage Minerals terminal plays a key role in storing and handling liquid cargo at the Port of Rotterdam. The company operates loading and unloading jetties linked by pipelines to 101 storage tanks that provide a total of 1,100,000m3 of storage. Blending equipment is also connected. Products handled at the terminal include a wide range of biodiesel and petroleum products, including fuel additives.